Despite trying to inspire my clients on a daily basis I still struggle with feeling inadequate as a Mom.I did this morning as I was struggling to get my 3-year-old dressed for school. We were late. I had been asking her for 40 minutes to get dressed and eat her (now cold and lumpy) oatmeal. I yelled at her. I’m Mom enough to admit it and Mom enough to admit that I was ashamed. I felt inadequate (and gross) when my son smeared poop on his eye after breakfast…yes, his eye, as well as the wall, the rug, and of course me. I had to change, he had to change, and I had to speed down I-10 and hope that I wouldn’t get pulled over by the po-po. “Am I Mom enough to deal with this? !” I thought to myself. When I yanked that same 1-year-old son screaming off the slide at the playground with everyone staring at me I was Mom enough to carry him,the diaper bag, push the stroller back to the car and Mom enough to ignore the stares from strangers quietly judging me from behind their smart phones and lattes. Am I Mom enough? Sometimes I think I’m not. Other times I’m sure I’m not. I didn’t feed my kids dinner last night but I read a super long book at bedtime and gave them extra snuggles. That was enough. My house is a disaster (dusty base boards, anyone?) but my children are loved. That’s enough. I’m not the world’s best mom, fittest mom, sexiest mom, prettiest mom, smartest mom…but I’m THEIR mom. I’m enough. How about you? Are you “Mom” enough? Truth is, you are. Your an awesome mom, friend and leader Jacklyn! Thank you for sharing. I needed that reminder today (really everyday). Thanks for the post. Some days are harder than others. Even though we may feel “alone” as moms, meaning we feel like we are the only one losing it! lol. 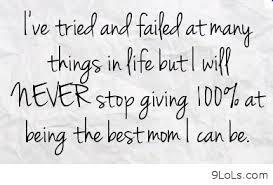 At the end of the day we are all doing our best to be the best moms we can be!